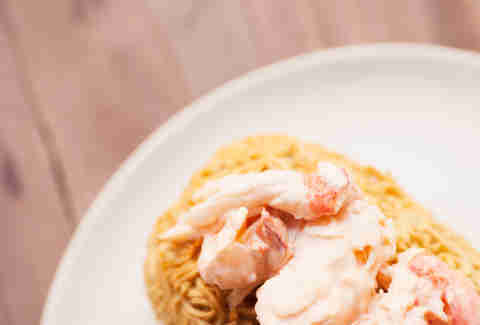 Everyone knows Maine-style and Connecticut-style, but get ready for Thrillist-style lobster rolls. I learned recently (like, two minutes ago) that the original lobster roll was invented by a restaurateur in Milford, Connecticut named Harry Perry. And that's also my name! Perry, not Harry. Whatever, this means something, trust me. There’s no bread in this recipe, but never fear -- the butter didn’t go anywhere. 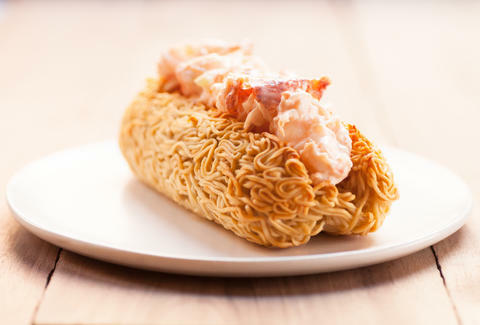 It’s soaked in, brushed on, and baked into the ramen noodles for a toasty, buttery bun that’s crunchy on the outside and chewy on the inside. The lobster? That's the easy part. Just make sure it's fresh as hell and do your best not to eat it all while you're creating the bun. Bring 2 quarts of water and salt to a boil. Add noodles and cook until noodles separate but aren't completely soft, about 2 minutes. In the meantime, whisk together the egg, 1 tablespoon melted butter, and potato starch in a small bowl. Spread a 2-foot-long sheet of plastic wrap on the counter, with a long side near you. Drain noodles and add to egg mixture. Using tongs, gently toss the noodles to coat them. Transfer to the plastic wrap and let cool enough to touch. Gather noodles into a pile in the center. Pull the bottom of the wrap up and over the ramen and compress into a loaf (like you’re making a fat sushi roll). It should be 3 inches thick. Once rolled up, twist one end tight while pushing air out toward the open end. 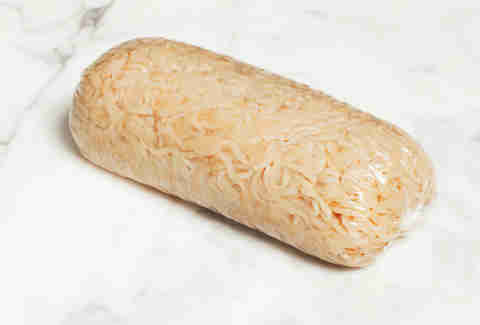 Mash and mold the noodles until the loaf is 6 inches long. Twist the other end shut to compress and tuck both ends underneath the loaf [SEE PHOTOS BELOW]. Refrigerate for at least 1 hour. In a small bowl, whisk the mayonnaise, water, mustard, and hot sauce. Salt to taste. Cover and refrigerate along with the noodles. Preheat oven to 425°F. Line a baking sheet with parchment or spray it with cooking oil. Remove noodles from the plastic wrap. Slice a narrow "V" lengthwise down the center, making sure not to cut through to the bottom. Gently remove the noodles that were cut. Transfer bun to baking sheet and bake until noodles start to crisp up, 20 minutes. Combine lobster and celery with dressing; toss to coat. Cover and refrigerate while the bun bakes. Remove bun from oven and brush remaining butter (you may need to re-melt it) all over. Return to oven and bake until golden brown, 10-15 minutes. Let the bun cool for 5 minutes before stuffing it with lobster salad. Pull plastic wrap over the noodles and tuck it into a tight, 3-inch-wide roll, getting all the air out. Twist one end tight while pushing air out toward the open end. Mash and mold the noodles until the bun is 6 inches long. Twist the other end shut to compress. Tuck both ends underneath the bun and stick it in the refrigerator.